This elliptical trainer is suitable for those who are looking for a non-impact running and walking machine. 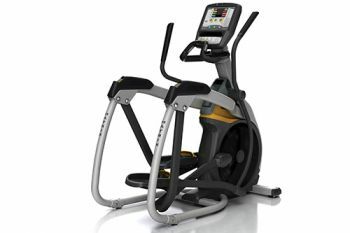 It has a 16” touchscreen display with FitTouch technology offers intuitive operation and adopts the technology behind all Matrix connected equipment, enabling you to track your workouts and access a personal training programme. You can also benefit from the Advanced Sprint 8 High Intensity Interval Training (HIIT) programme and the Virtual Active programming, which provides an immersive exercise experience. This elliptical trainer has a 21" stride length that accommodates all users for a comfortable, efficient, and natural workout and contralateral action with tapered, dual action handlebars, mimicking the body’s true movement. It also has Ergo Form Grips with integrated controls which enhance comfort and accessibility of key functions. This machine provides touch-free login and is compatible with most smartphones and tablets for video, audio, charging and on-screen playlist selection.